Take a slow deep breath, then exhale, and relax. Be still for a moment, and feel your body as you sit upon the couch, chair or floor. Take another deep breath.…and let it out. And another. And with each one, you feel yourself becoming relaxed and calm, receptive and aware. As you gaze at the candle flame in the center of the room, you feel your own, inner flame, the spark of divinity within you, awaken in response. Close your eyes now and see the candle flame with your inner vision, and watch as it grows in size, strength, and brightness. Take another slow deep breath, and as you exhale you watch the flame growing...and feel your inner flame growing stronger and brighter as well, and your awareness and receptivity increasing along with it. You step through the curtain of flame and find yourself to be in a very different kind of place. You are standing at the edge of a woods, looking into a clearing, in the midst of which sits a small stone building. It is a cold wintery night, and overhead the stars shine brightly in the deep blue sky. The tiny crescent of a moon is visible, but the stars are bright and provide illumination. You walk towards the stone building, and as you get closer you can see it is a chapel of some sort, with three wooden stairs that lead up to a porch and a wooden door. You spend a few moments looking at the carvings on the wooden door.....then you climb the stairs, push the door open, and enter the chapel. The starlight gleams down into the roofless chapel, giving a dim illumination to the interior. You see a cobbled stone floor, a few icons on the walls, some wooden benches, and at the front of the chapel, a stone altar. On the altar is a beautiful golden cup. On instinct you place your hands on the golden cup that is sitting in the center of the stone altar. As you sense all the unseen faces in the chapel turning skyward, you lift the golden cup to the sky. The beams of light pouring down from the large star flow into the cup, filling it with a light both silver and golden, a light that fills the cup to the brim, and then overflows. The beams of light from the sky flow onto your head and into your body, as well. They splash onto your shoulders, run down your back and front, run down your arms and onto your hands. The light is infusing your body, and you know it is infusing all the other beings in the chapel, as well. A moment of silence follows.... and then you feel the great angelic presence behind you slowly withdraw its energy from you.... After another moment, you again hear a rustle of movement, as the spirits arise and depart from the chapel. 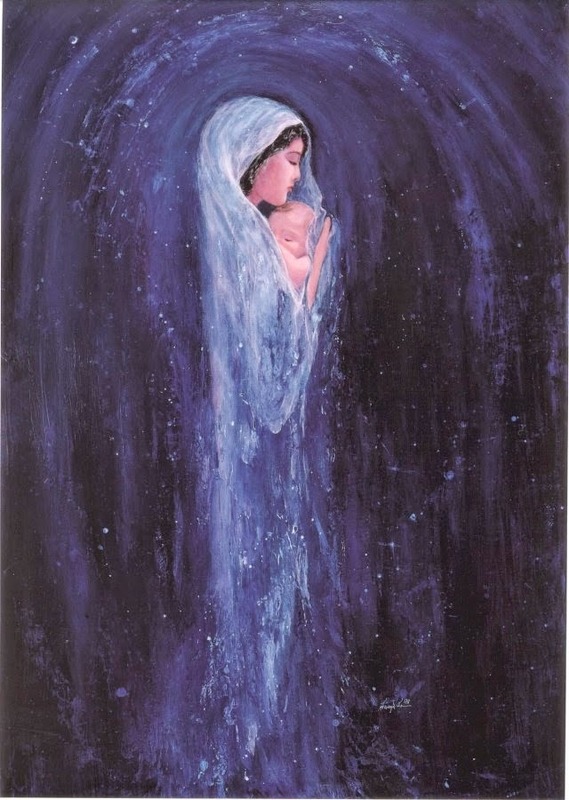 Then your vision shifts again, and although you still feel the presence of mother and child, you see only a starlit sky. You begin walking across the clearing, and just past tree line, you see a fire burning in the distance...You walk toward the fire, and find that each step you take brings you more and more into your normal waking awareness. You reach the fire, step through the flames, and find that you have come back to this time and this place, into a room where candles glow and perhaps, a hearthfire burns.... You are back…. And when you feel ready you may open your eyes. With your inner vision, you watch the candle flame grow in size till it becomes a wall of fire, a curtain of flame. You step through the curtain of flame and find yourself in a very different kind of place. You are standing at the edge of a wood, looking into a clearing, in the midst of which sits a small stone building. It is a cold wintery night, and overhead the stars shine brightly in the dark clear sky. The moon has set but the stars are bright and provide illumination. You walk toward the building in the clearing, and as you get closer you can see it is a small chapel, with three wooden stairs that lead up to a porch and a wooden door. In the early years of Spanish rule in Mexico, during a time in which the Indians were being (often forcibly) converted to Catholicism, she appeared on December 9, 1531, to an Aztec Indian man, remembered now by his adopted Christian name, Juan Diego. It was early and Juan was on his way to Mass when he passed Tepeyac, a hill previously the site of a sacred shrine to the Corn Goddess, Tonanzin -- whose name means “Our Mother.” He was surprised to hear birds singing -- apparently rare in the winter -- but even more surprised when he saw a lovely young native woman standing near the top of the hill. She greeted him with maternal affection, calling him her “little son.” A golden mist surrounded her, and she was wearing a dress covered with traceries of flowers and leaves, and a blue cloak with eight-pointed stars on it. 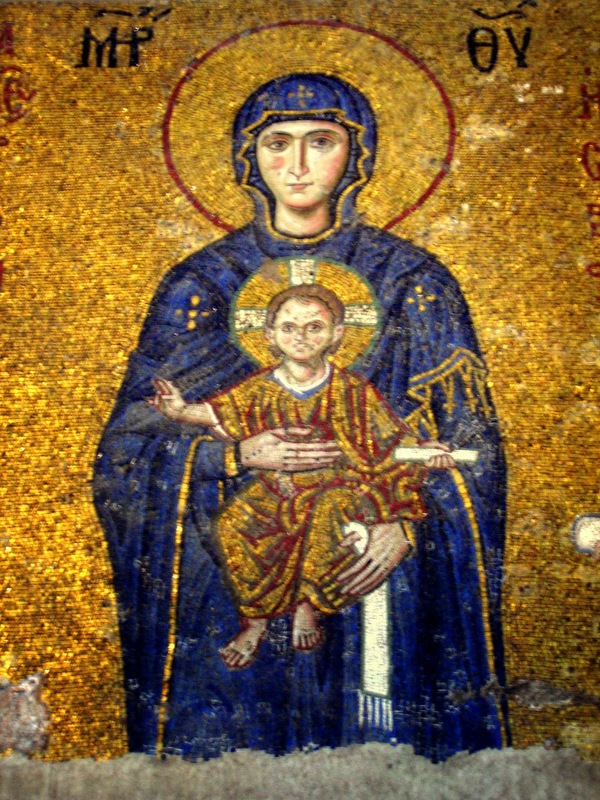 (In the past the eight-pointed star has been a symbol of Inanna and the planet Venus) She identified herself as the Virgin Mary, the Mother of God, and said she wanted a temple built for her at that place. The more closely I examine pictures of this miraculous cloak, the more interesting it becomes to me. Her cloak is blue, with stars on it. This would seem to represent the night sky, lit only by stars. Her gown is covered with images of flowers and plants, traced in a deep reddish-gold against a pale rose background, clearly representative of the earth’s plant kingdom. Taken together, the cloak and gown seem to represent the star-filled night sky and the plant-filled fertile earth. She wears a black sash, which to the Aztecs of the area signified pregnancy. She stands upon a crescent moon that is held by an angel. The angel holds the edge of her gown in one hand, and the edge of her cloak in the other, as if to show the union of heaven and earth, and to indicate that she is important in both realms. She is encased in an oval whose shape is reminiscent of an auric field. She is surrounded by what appears to be rays of light, the source of which—mostly likely the sun—seems to be behind her. 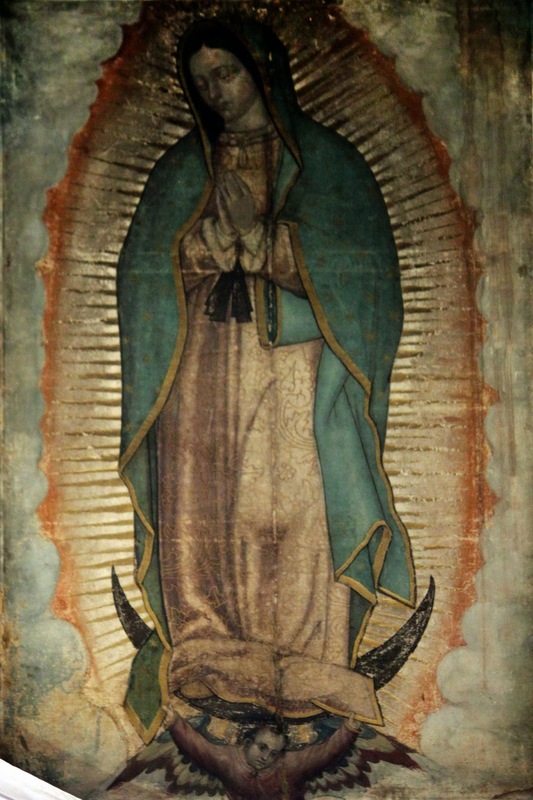 All this fits rather precisely with the description of the woman in the Book of Revelation, who was “clothed with the sun and the moon under her feet.” While the Virgin of Guadalupe does not wear a crown of 12 stars as the woman in Revelation does, she does wear a crown (more apparent in the older images than the more recent ones), the spikes of which blend in with the rays of light that surround her. The woman in the Book of Revelation is pregnant, about to give birth, and “travailing in labor.” As I mention in my book, I feel the woman described in the Book of Revelation to be the Goddess giving birth to the new age—at that point in time, the Age of Pisces. 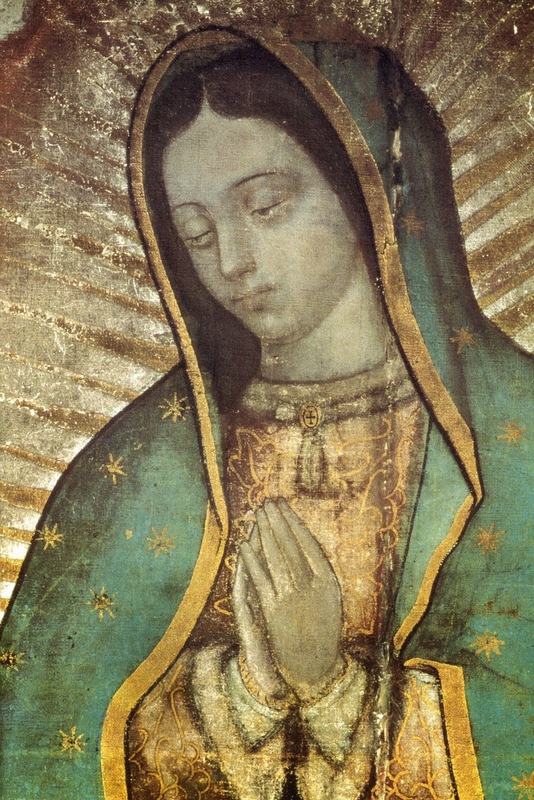 The image of the pregnant Lady of Guadalupe, who appeared in 1531 to Juan Diego, so closely fits this description that it seems to me that she might well be indicating the goddess who births our new age, Aquarius. While the Age of Aquarius was not was not dawning in 1531, it was just below the horizon – so to speak – and a new way of being was certainly on its way to the world, particularly the “new" world of the American continents. Truly, the words of a mother. She is our mother indeed! 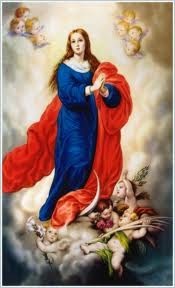 Once again, here is my posting on this Marian feast day, originally posted a few years ago.